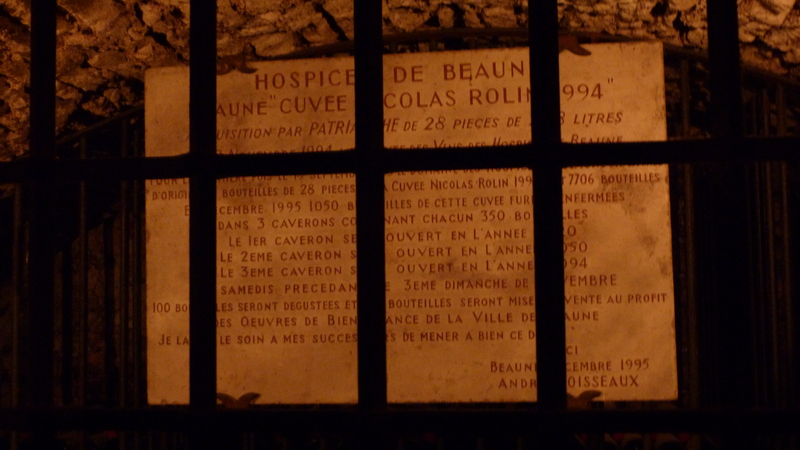 Beaune has been at the heart of Burgundian culture since the days of the druids. During the Middle Ages, Beaune was a city of drapers, and cloth merchants made their fortunes there. Over the centuries, generations of Dukes waged wars, created courts of fame and beauty, and commissioned some of the most exquisite illuminated manuscripts ever produced. English Kings married into the Burgundian courts and helped to secure Beaune’s fame as a place of refinement and culture. Today, the commoners come for the wine. Grape culture is tantamount to a religion, and I’m an adherent. 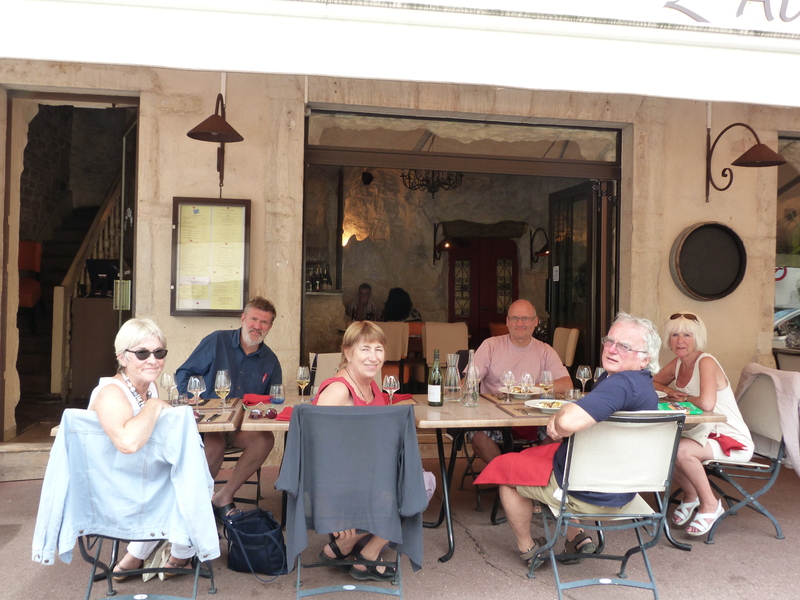 We travelled to Beaune (population 22,000) with our cousins Peta and Bryan and friends Annie, Suzanne and Christian. 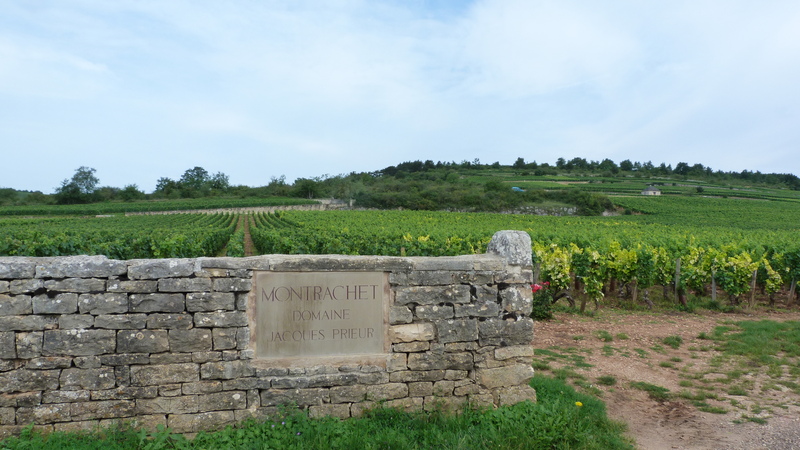 Suzanne and Christian had introduced us to many flavours of the local terroir on our previous visit to France, and so when Christian proposed a day of wine tasting in Beaune, we jumped at the opportunity. We drove along the Route des Grands Crus and into the Côte d’Or, fields of placidly graving Charolaise cattle giving way to thousands of acres of densely planted vines. 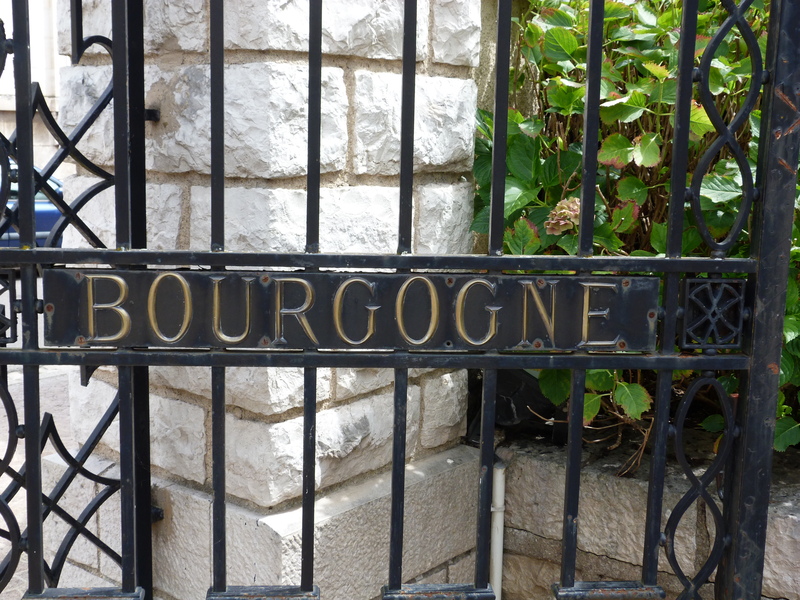 We skirted the edges of Mercurey, Saint-Aubin, Meursault, Pommard – names of the towns are synonymous with varietals. 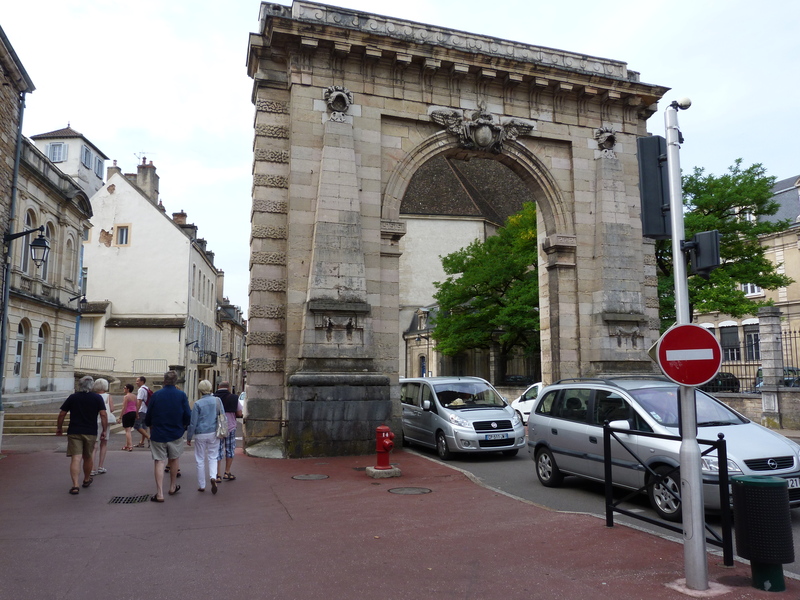 We entered Beaune through the welcoming gate of Saint Nicholas and headed to Cave Patriarache Père et Fils. Cave Patriarache was started by Jean-Baptiste Patriarche in the eighteenth century. In 1796, he purchased the Ancient Convent of the Sisters of the Visitation, which had been confiscated during the French Revolution. Jean-Baptiste had outgrown his original building in Savigny-les-Beaune and saw that the convent’s extensive cellars would give him the room he needed for his growing business. 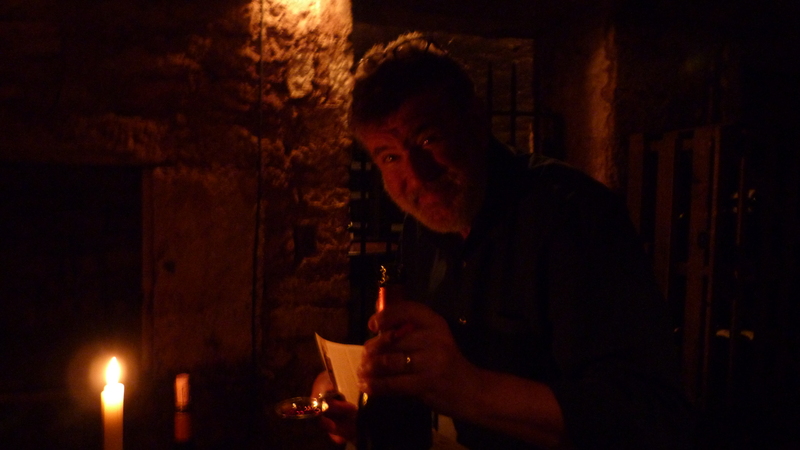 Cave Patriarche now has the largest cellars in Burgundy. 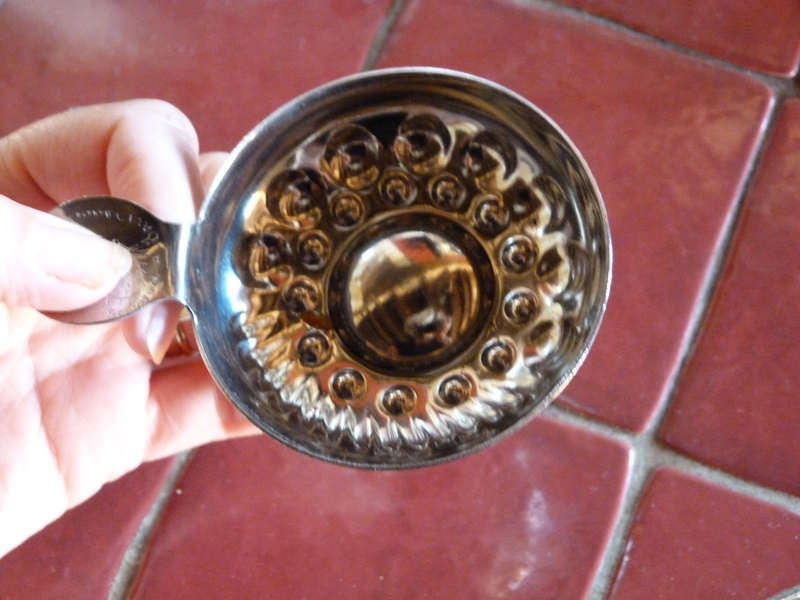 Upon entry, we were each given a small, flat silver cup, a “coupelles tastevin” to use for our tasting. The bumpy surface of the tastevin is designed to catch and refract the light to best show off the wine colour. We descended deep under the streets of the town, through 5 kilometers of dark paths created by rows and rows of dusty bottles. Sections of the cellars date back to the fourteenth century, when they were used by the Monks of Chatreux to age their wines. There are literally millions of bottles in the cave and the walkways stretched out to dark corners far beyond our vision. Wines for tasting were set up along our route, designated by candles and open bottles placed on barrels. Three whites, twelve reds. Our enthusiasm grew as we wended our way deeper into the cave. In 1995, 350 bottles of an exclusive and promising vintage were put aside to be donated to an annual auction to raise funds for L’Hôtel Dieu de Beaune. The bottles are under lock and key, quietly waiting for future discerning oenophiles, to open them as specified – in 2020, 2050, and 2094. We stopped to pay due homage. Unfortunately, most of the Patriarche wines were out of our price range. We fell in love with a 2000 Pommard, 1st Cru but resisted purchasing a bottle. Instead, we topped up our tastevin just a bit and savoured every drop, before reemerging into the daylight and wended our way to lunch. Christian had selected L’Air du Temps, for our repas of Burgundian flavours. Our prix fixe was a 3-course meal of local gastronome. I chose the Véritable Persillé de Bourgogne (a wonderful pork and ham pate, marbled with parsley), avec compotée d’éschalotes aux cassis; Bourguignon de Joue de Boeuf et Roseval (a Beef Bourguignon as I have never tasted, with tender morsels of beef slow-baked on thinly sliced potatoes); and Financier aux baies de cassis, sorbet cassis (a soft cake with blackberries and fresh blackberry sorbet). Every mouthful was a masterpiece. I felt like a spoiled Burgundian duchess. 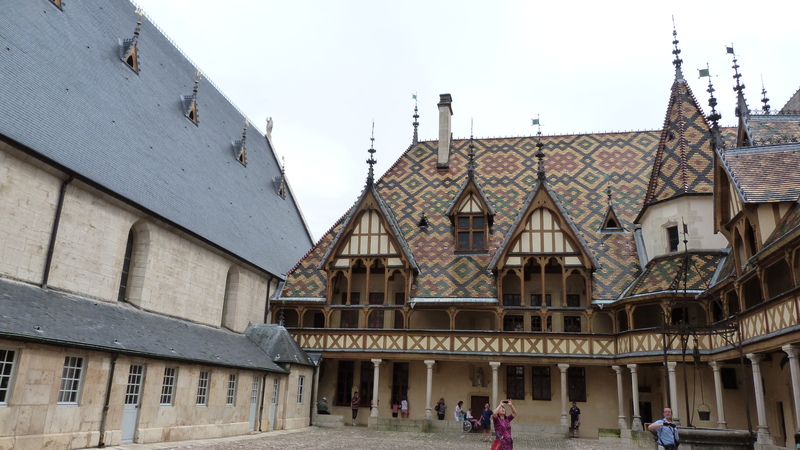 Our last stop in Beaune was to visit L’Hôtel Dieu de Beaune, the shining star of the city. In 1443, Nicholas Rolin, chancellor to the Duke of Burgundy, and his wife Guigone de Salins established the Hôtel Dieu as a “palace for the poor”. Nicholas gave a vast amount of his fortune to create and maintain the hospice. It is a stunningly beautiful building, famed for its remarkable roofs of coloured slate. Nicholas also commissioned artwork and tapestries to give comfort to the patients, including a huge triptych of the last judgment that was kept closed, only to be revealed to dying patients as part of their last rites. Inside the hospice, thirty beds lined the walls of the “Great Hall of the Poors”. It was a respectful environment – the beds were designed to be private, yet accessible to the nuns who cared for the sick. Along with the nursing sisters, Hôtel Dieu housed doctors and scientists who worked in the laboratory. In the pharmacy, a resident apothecary created medicines from herbs, spices and tinctures. The busy kitchen cooked for everyone and baked 100 loaves a day to give away to the poor in the town. The hospice is still going strong. In 1971 it moved to new facilities, leaving the original building as a museum. Funds raised from the annual 450,000 visitors, and from the exclusive wine auction to which Cave Patriarache contributes, go to the hospital’s charitable works. “Nothing vast enters the world of man without a curse.” Sophocles. I think of this line often when I work on my computer. Like everyone else, I am oppressed by the Internet. I am burdened by a constant stream of emails and by the overbearing sense that I “should be doing more”. More tweeting, more blogging, more adventuring in to the virtual unknown. For the most part, I try to resist these impulses. My life is rich, and seldom improved by spending more time on my computer. But that said, there is the occasional surprise, something that could never have happened without this wonderful and terrible invention. Recently, I received an email from a woman in South Africa named Zerilda Wessels. Zerilda lives in Stellenbosch, which is about 50 kilometers west of Cape Town. She is a painter and studies at the Marie Stander Art School. Every year, students from the school are invited to exhibit at Muratie, a winery in the Knorhoek Valley north of Stellenbosch. The Stellenbosch area has been at the centre of South Africa’s wine industry since the eighteenth century – the first wine was pressed in 1659 – and Muratie is on one of the oldest estates in South Africa. Sales from the Art School exhibit raise funds for local charities. Last year (2013) they raised over $20,000 CAD and the funds went toward various educational institutions, helping with the purchase of school clothes, educational books and material, music instruments, sport equipment for children of need in and around the Stellenbosch area. 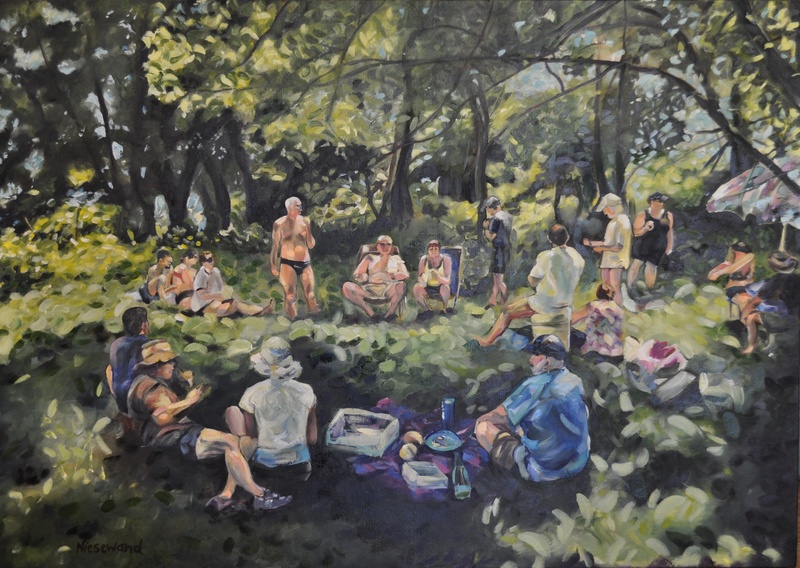 For the 2014 exhibit, Zerilda wanted to paint a picnic, something in the style of Renoir, thinking in particular of his “Luncheon of the Boating Party”. So she searched the Internet for images of picnics. Somewhere, amidst the mass of Google images, she found a photograph that I took 3 years ago when Tim and I were canoeing on the Loire. 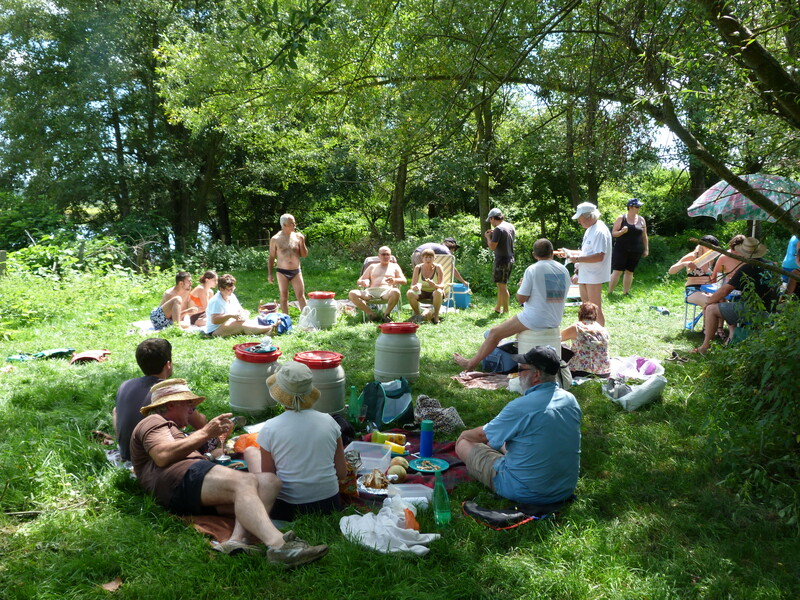 We were with a wonderful group of French friends, enjoying a mid day picnic of exquisite excess. I had blogged about the adventure, and, in the way that things work on the Internet that I don’t entirely understand, the photograph I took was out there waiting for Zerilda to discover it. Zerilda worked with the image to recreate it in oil paint, developing it in an Impressionist style, enhancing the sense of occasion and camaraderie. I am totally enchanted by the idea that a moment of my life has inspired this lovely painting. It’s a thrill to see Tim, Peta, Bryan and Matt in the foreground, to remember our delight at the food, wine and company that afternoon. Somehow the painting makes the memory more permanent. I love seeing us as a Renoir moment. It is amazing to think that a little part of me, and my memories, exists on someone’s wall on the other side of the world. I doubt that I will ever have the opportunity to travel to South Africa, but I know that if I do I will have a friend there, someone who has spent time trying to see the world as I saw it one sunny afternoon in France. And, at the risk of being entirely too sentimental, I am thrilled to think that I have a small connection to helping a child toward a better educational life, courtesy of Zerilda. OK, maybe there are some redeeming qualities to the Internet.